I love Dr. B Soaps and the bar soaps are no exception. They are made with organic oils and last a long time. The scents are strong, but not overpowering and they give me a great lather and are great for anyone who wants to be eco-, animal- and skin-friendly. I like to use the lavender to spot treat laundry, the peppermint to wake myself up and tea tea tree oil in my kitchen. They are more expe...read morensive than most soaps you can buy in a drugstore, but for the quality and the organic ingredients I think they hold up quite well to conventional and organic soaps. If you aren't a fan of liquid soaps, I'd recommend giving Dr. B's bars a whirl. I love using this bar soap to cleanse my face! It has such a nice smell and lather! It feels great to use! I won't use anything else since discovery this soap!! I was always a Bath & Body girl until my mom insisted upon me trying this soap. OMG - I've never had a bar of soap lather up like this does and you can literally feel how clean you are. 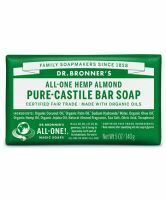 I've tried pretty much all of the scents that Dr. Bronner's makes in the bar soap and have found Lavendar to be my favorite. Peppermint is a nice summer time scent and leaves your skin feeling cool. I cannot recommend this soap enough!! I will never use anything else! !